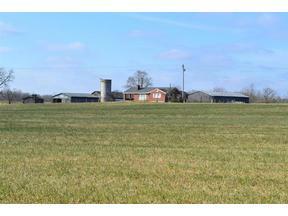 Nice 150+/- acre farm located in North Mercer County! This farm has many possibilities including crops, livestock, horses, and recreation. Farm has good soil and 1.5 miles frontage on Salt River. Many improvements including a 3 Bedroom Brick home with basement and 5 barns or buildings. Currently being used as cattle and crop operation. Also there is a large spring on the farm that may have been the reason for the D.L. Moore Distillery operating there in the 1800's. This is a good operating farm with road frontage on 2 roads. Must see! Call for a private showing!